My name is Anna Sitkoff and I live in Seattle, Washington. I work as an Herbalist at Dandelion Botanical Company and I am in my 4th year of Naturopathic medical school at Bastyr University – deepening my understanding of our phenomenal bodies. I have spent time learning about mushrooms through many lenses. First, by spending time with them in the forests, doing mushrooms fasts and watching them through the seasons. I got to know them more through different medicine making processes and uncovering their secrets through different extraction methods. I check the literature about once a week for new research that has been done, and through Bastyr I have been fortunate to have the opportunity to do mushroom research – looking specifically at different cancer cell lines and the cytotoxic and immune-modulating effects of Fomitopsis cajanderi. My hope in writing this blog, is for people to feel educated and empowered through having well researched information available to them. I will be teaching a few classes at Dandelion Botanical Company, and various conferences. Here, I provide my notes, recipes, and monographs. Enjoy! thank you for sharing like this! Great Blog Anna! I have a question… Is it possible to still make a broth with Artist Conch after they’ve dried hard? Hi Magda! You can definitely make a broth with whole dried Artist Conk. It is difficult to slice them when they are already dry, so you can stick the whole mushroom in to boil, it will just take a little longer to extract. Thanks for checking out my blog. Let me know if you have any more questions. Thank you for sharing the wealth that all are entitled to ! You are a treasure !! Hi Brian, thank you for checking out my write up on making fabric with amadou. In my experience, it seems like the bigger the mushroom, the bigger piece of felt you can pound out. I’ve tried pounding strips together, but it has yet to work, and I don’t think that it is possible. Always worth experimenting though! Please let me know if you come up with any new ways to fuse the pieces together. I have heard of using a special glue that has a seamless finish, though haven’t tried it. Best bet for making a hat seems to be to look for the biggest mushrooms! I really love your content. I’m in Portland and have learned a lot. Thanks! 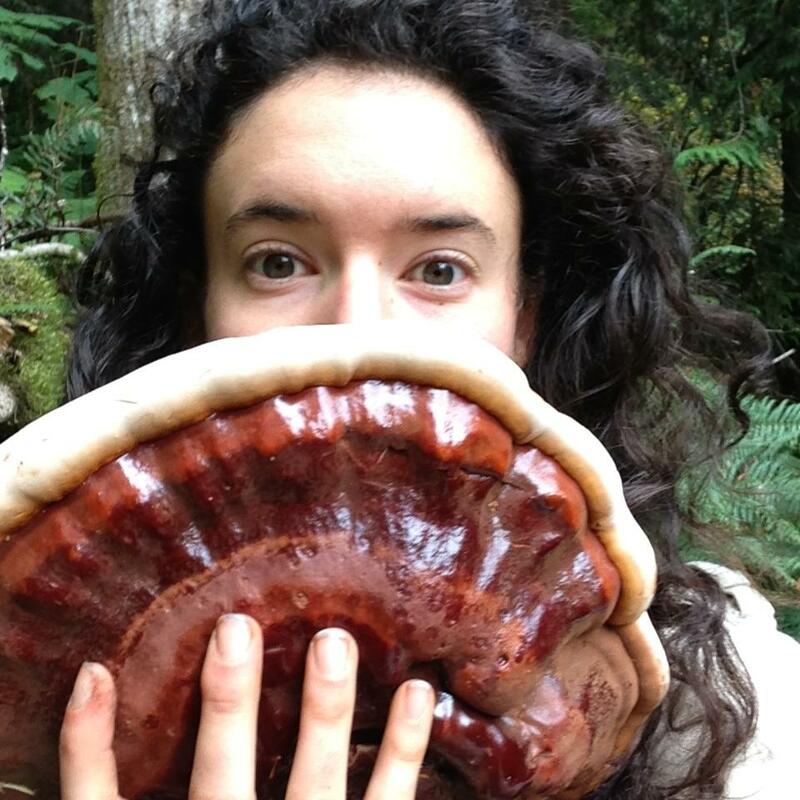 I stumbled onto your site whilst researching the different varieties of Ganoderma that grow here in the PNW. Love your writing, very poetic and informative! Thank you for sharing. Hi Anna- I went on your herb walk at the Bastyr Herb Fair and you mentioned making something out of green Douglas Fir cones- do you remember what it was? Hi Heidi! I put the Doug Fir cones in water and they have a lot of wild yeasts on them and sugars, so they start fermenting pretty fast, and they make a great yeast starter. I also just put them in my water and drink throughout the day. Nice! So then would you use the starter with fermented veggies? bread? Really nice job, keep going!! I have a question about you concentrate extract of (coriolus, fomitopsis, ganoderma). You didn’t talk about a dosage? Which quantity if i use it as a therapeutic or if i use it as preventive. I have to be careful about talking dosage with medicines on the internet, but I can tell you what I typically do for myself. For preventative I take about 3 mL extract 2x per day and for treatment I double that amount. Thanks for your blog & wonderful work that you are doing! Looking forward to reading more! Câte grame pulbere uscată de Fomitopsis pinicola pe zi se poate folosi preventiv? Pace! I love your blog! I just came upon Trametes Elegans and was trying to find some info about it’s medicinal properties… found this and thought you may like to see/know about it! I just tried to make the reishi powder extract with your method. It is still pretty fluffy even when I put it in the high speed blender for a long period of time. Do you think I should do the slurry thing again and then dehydrate it again? When I did it with the Hericium it powdered up really well. Thanks! Hi Anna, I love this blog, it is such an incredible learning tool. Do you sell pdf versions of you “Mushroom Constituent Chart”? I would definitely buy one if you do. What is your email address? I’ll send PDF to you. You can donate $5-10. Paypal or Venmo.